Algae (singular: alga) are plants or plantlike organisms that contain chlorophyll (pronounced KLOR-uh-fill) and other pigments (coloring matter) that trap light from the Sun. This light energy is then converted into food molecules in a process called photosynthesis. Most algae store energy as some form of carbohydrate (complex sugars). Algae can be either single-celled or large, multicellular organisms. They can occur in freshwater or salt water (most seaweeds are algae) or on the surfaces of moist soil or rocks. The multicellular algae lack the true stems, leaves, or roots of the more complex, higher plants, although some—like the giant kelp—have tissues that may be organized into structures that serve particular functions. 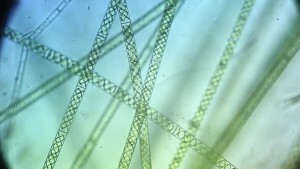 The cell walls of algae are generally made of cellulose and can also contain pectin, which gives algae its slimy feel. Although the term algae originally referred to aquatic plants, it is now broadly used to include a number of different groups of unrelated organisms. There are seven divisions of organisms that make up the algae. They are grouped according to the types of pigments they use for photosynthesis, the makeup of their cell walls, the types of carbohydrate compounds they store for energy, and the types of flagella (whiplike structures) they use for movement. The colors of the algae types are due to their particular mixtures of photosynthetic pigments, which typically include a combination of one or more of the green-colored chlorophylls as their primary pigments. Algae is quick growing and can be potentially harmful to humans and livestock. Filamentous algae is green in appearance and sometimes brownish in colour if exposed to strong sunlight. It appears floating on the waters surface, amongst submerged rocks or in the shallows of dams and lake edges and is stringy. Micro algae can contain toxins such as in Blue Green Algae. Micro algae looks like a green oil slick or paint on the waters surface. This form of algae can be toxic to humans, domestic or native animals and birds. It is of most concern when people are in contact with the contaminated water or if it is used for irrigation. Aquatic Technologies offers a number of services and products to control all types of Algae. Most microalgae grow through photosynthesis – by converting sunlight, CO2 and a few nutrients, including nitrogen and phosphorous, into material known as biomass This is called “autotrophic” growth. Other algae can grow in the dark using sugar or starch (called “heterotrophic” growth), or even combine both growth modes (called “mixotrophic” growth). Algae are capable of reproducing through asexual or vegetative methods and via sexual reproduction. According to the authors of “Algae,” asexual reproduction involves the production of a motile spore, while vegetative methods include simple cell division (mitosis) to produce identical offspring and the fragmentation of a colony. Sexual reproduction involves the union of gametes (produced individually in each parent through meiosis).